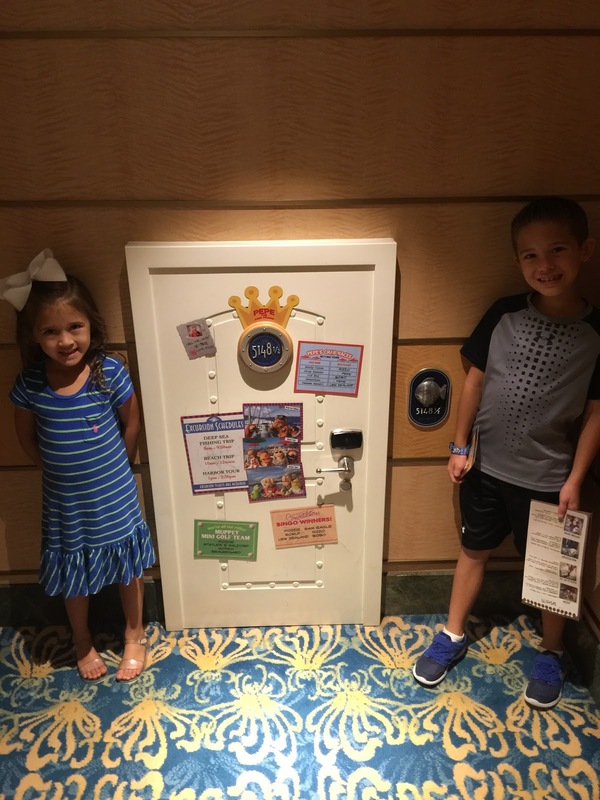 This Thanksgiving, we went on a Eastern Caribbean cruise on the Disney Fantasy. 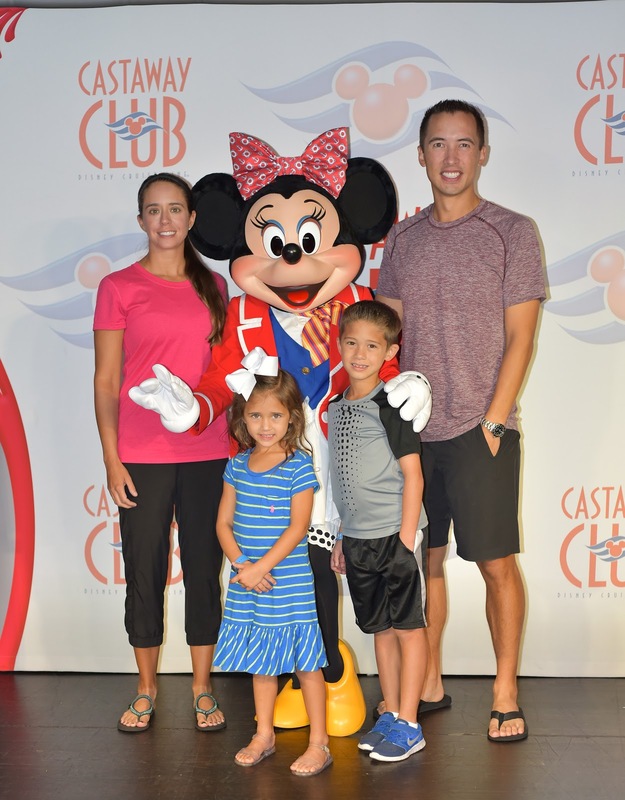 The Fantasy set sail on Saturday, November 21st and stopped at St. Maarten, St. Thomas, and Disney's Castaway Cay. We drove to Port Canaveral on Saturday and got aboard pretty quickly. There was quite a line to sign the kids up for the Oceaneer's Club, which was unusual. Recently, instead of waiting in long lines for things like the princess gathering, they've been using a ticketing system. Unfortunately, this just moved the waiting from the time when the event happens to the time when you have to wait for your chance to pick up a ticket. After the kids were signed up for the Oceaneer's Club, Andrea ended up waiting for an hour for her chance to reserve tickets. Right when she got to the front of the line, the computer system went offline and she waited another 30 minutes for the computers to start working. She finally got our tickets reserved, but when they came to our room they were for the wrong times and we had to correct that issue. 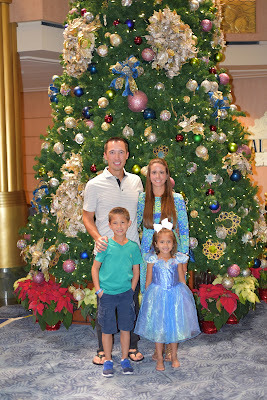 It ended up being a fairly rough first day and we didn't end up taking a "setting sail" picture like we normally do, but did get a picture in front of a Christmas tree in the cruise port terminal that was pretty. Our first two days were sea days and we spent most of our time playing mini-golf, watching movies, going to the shows, and relaxing together. On Tuesday morning, we had a character breakfast and the Disney Junior cast came around to our table to say good morning to us and take pics. After breakfast, we met with Princess Anna and Queen Elsa and then had the Princess Gathering. Connor didn't care to go, so we let him go to the Oceaneer's Club instead. 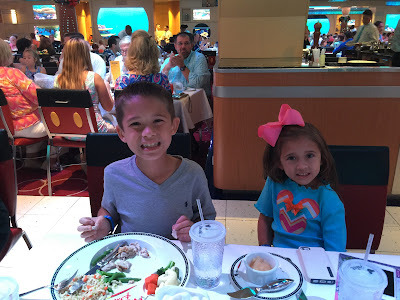 The kids both really enjoyed the kids area this cruise. We even let them find their way from the room to the Club on their own a few times, and Andrea would call after a few minutes to make sure they arrived. You're not allowed to take pics inside, but I did sneak a pic of Paige checking in after the Princess Gathering. 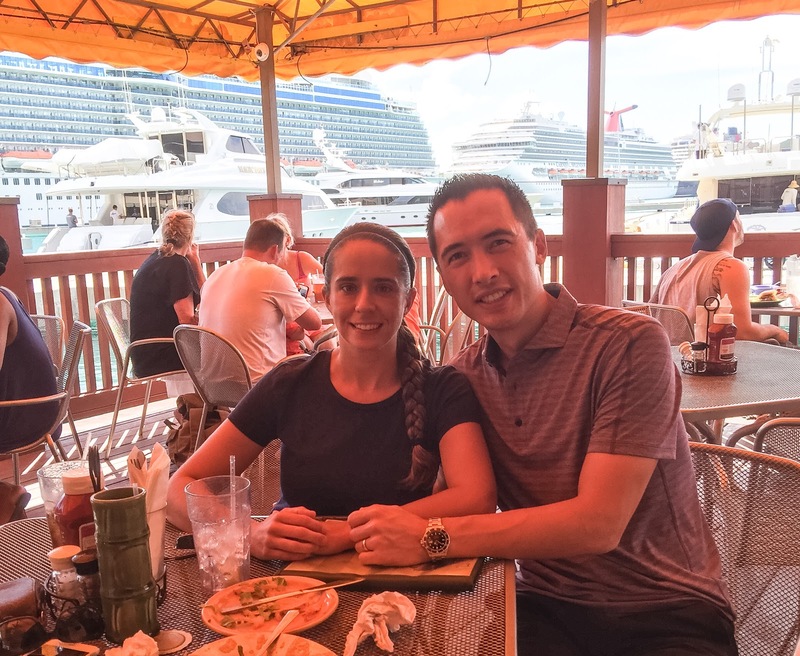 On Tuesday, November 24th, we arrived in St. Maarten. There weren't a lot of things to do for the kids there, and Andrea and I hadn't really done anything there besides excursions so we decided we'd explore the town a bit. The kids stayed on the boat in the Oceaneer's Club and Andrea and I debarked and took a taxi downtown. Unfortunately, it was brutally hot. We were sweating our butts off pretty quickly and it was difficult to find a place to cool off. We ended up stopping for drinks in a little restaurant, the Big Wood Grill. It had wi-fi, which was nice, but the menu wasn't what we were looking for. We wandered around a bit more, looking at menus, but ended up going to the Hard Rock Cafe for some nachos and Dr. Peppers instead. After lunch, we struggled to find a restroom that wasn't disgusting or too expensive, and then struggled to find a taxi back to the boat. We decided to get our pic in front of the "Welcome to St. Maarten" sign, and you can tell I'm sweating my booty off in the pic. We were relieved to get back to the boat eventually, and decided that in St. Thomas we'd try something a little simpler. On Wednesday, November 25th, we arrived in St. Thomas. After our St. Maarten experience, we decided we'd stay on the boat for the first part of the day. We ate a quick breakfast, then enjoyed the quiet boat. During the previous sea days, the pool and slides had been crazy, loud, and crowded. On Wednesday, they were nearly empty. The Aquaduck line is typically 20-30 minutes, but we were able to usually walk right up and sit right down in the rafts. I rode it a couple times with Connor and then decided I'd try to see if Paige could ride. She'd been a millimeter too short on our last cruise, but had grown about an inch and a half and they didn't hesitate to let her through. She had been riding the little yellow slide all morning, but after the first ride on the Aquaduck she never wanted to ride it again. I rode it over and over with her about six or seven times and then the line started to get a little bit longer. It was only a five minute wait, but after our earlier experiences that seemed like a lot. Andrea managed to get a video of Paige going around on her very first ride. We swam in the pool, watched Mulan on the big screen, and then decided to go in. The kids went to the Oceaneer's club for a couple hours and Andrea and I got off the boat and walked to a nearby restaurant we liked, the Fat Turtle. We ate lunch and then got back on the boat and played mini-golf and did mysteries with the kids for a bit before dinner. 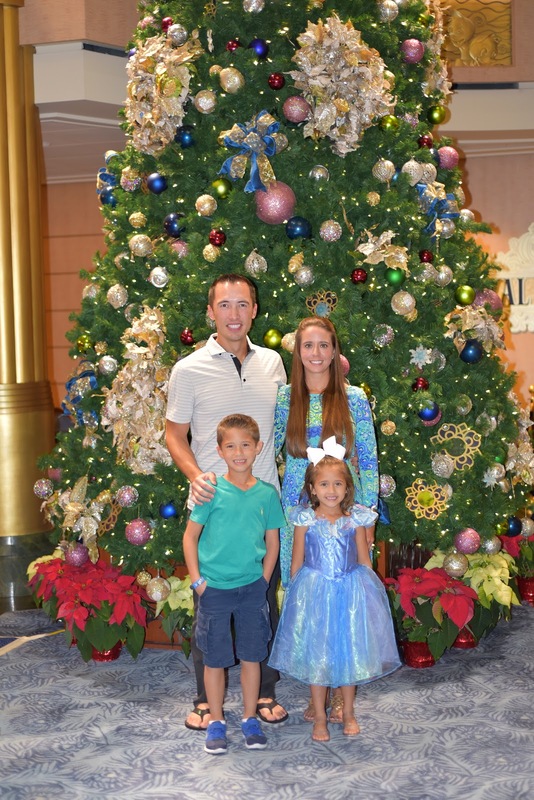 After dinner, there was a Christmas celebration, with characters, dancers, Mickey, Minnie, Santa Claus, Mrs. Claus and finally Elsa and Anna came out and Elsa made it snow in the lobby. 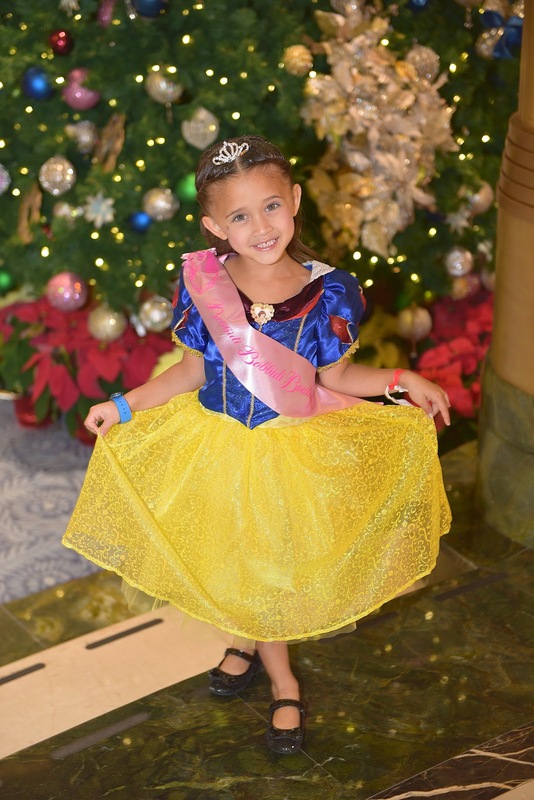 On Thursday, Thanksgiving, we had our last sea day and it was also the day for Paige's Bibbidi Bobbidi Boutique appointment. She'd been looking forwards to it all cruise long, and it was finally the big day. Paige's fairy godmother was a big Disney fan and had all kinds of questions about Disney trivia and princess trivia, and Paige got almost all of them correct. I took a video of the magic spell and the big reveal at the end of the appointment. So beautiful! Paige was thrilled with the results, which is the important part. She felt like a fancy princess for Thanksgiving! Unfortunately, Thursday was also the most painful day of cruising on the boat. The wind was strong, the seas were high, and the boat rocked more than I'd ever seen on any cruise we've been on. Our stateroom was on the 9th floor and towards the front of the boat. It was impossible to even lie in bed in the room, we had to go to the lobby on the 3rd floor to deal with the rocking. Andrea and I took Dramamine, but Connor was feeling bad and wasn't old enough for it. He almost threw up once, and we gave him some Ibuprofen, which eventually did seem to help. Paige didn't mind at all, she was happy to be so fancy and did lots of twirls in her dress in the rocking and rolling lobby. 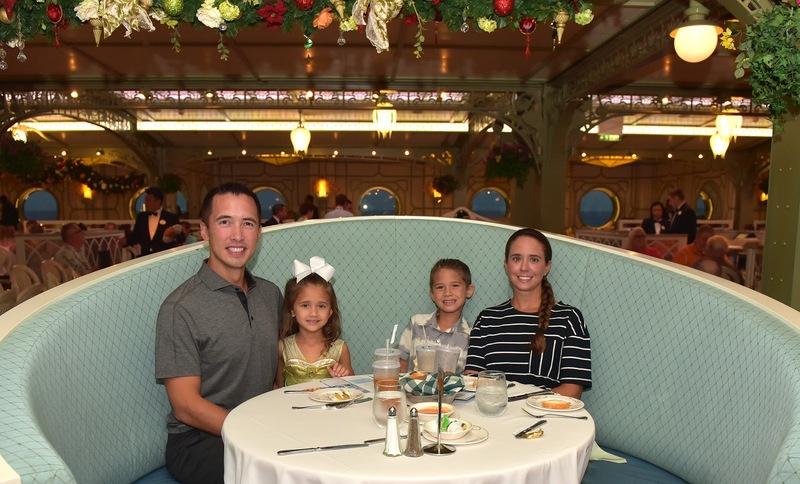 We took some pics with characters and then ate our Thanksgiving dinner in the Royal Court. The turkey was delicious! Connor and Paige loved it, and we were all stuffed like turkeys by the end of the meal. On Thanksgiving, they didn't have a stage show, but instead showed a brand new movie which was just released that day, "The Good Dinosaur". Andrea and I thought it was cute, but nothing really spectacular. However, Connor and Paige were emotional wrecks after the movie. Paige cried a few times through the movie and really liked it and was happy with the ending. It was Connor's favorite movie of all time. The rest of the night, any time he thought about the movie he would tear up. He didn't really even want to talk about it, but the movie touched him somehow in a deep way. The next day was a sea day, and Andrea thought to check the store and sure enough found some stuffed animals from the movie. Connor's always hard to buy anything for, and we were happy to find something that we thought he'd like. I took a short video of him opening up his surprise that evening. To answer Paige's questions from the video: No, she did not get one of Connor's stuffed animals. Yes, we did buy her a stuffed animal souvenir later on in the cruise. 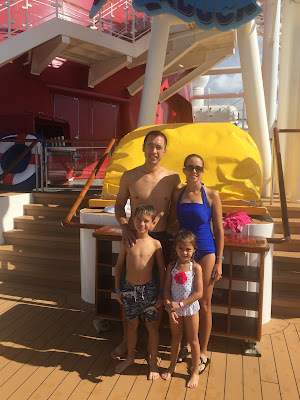 Friday, November 27th, was our last day of the cruise and we stopped at our favorite beach Castaway Cay. We took a few pics with the characters when we got off the boat and then we found a nice spot and played for a few hours. At lunchtime, we dropped the kids off at "Scuttle's Cove" to eat and play with other kids. Andrea and I spent some time floating around in the raft and inner tube that we'd rented. I towed Andrea around the beach and we enjoyed a little quiet time by ourselves. Around 2pm, I went to get the kids and Connor was angry with me for picking him up. He'd been involved in a very exciting game of beach soccer with some friends and didn't want to leave. We spent the last couple hours goofing around in the water and throwing Connor's football in the sand. Connor always manages to get sandy from his head to his toes. He loves diving in the sand and rolling around in it. Paige mostly played in the sand by the water, and they both liked it when Daddy became the shark and flipped them off of the boat/float. We snapped our last picture on the beach, with the Disney Fantasy behind us, just before we headed back. We spent our last night packing up, saying goodbye to our servers and steward, and getting everything together to go home in the morning. Our morning routine is pretty quick any more, we got up around 7am, got to our car by 8am, and were home before 10am. We had a productive Saturday today and I got much of our Fall decorations down and our Christmas decorations up. Andrea's got around three thousand loads of laundry to do and we need to go shopping for groceries. It will be tough to go back to our daily routines after such a fun trip. On our last day of the cruise, Paige found an eyelash and made a wish on it that we would get to cruise forever and that we wouldn't have any more world wars (we'd been talking about the Great War and World War II recently). The first wish didn't come true, but I'm keeping my fingers crossed for the second one!